Track 504 records from campus to campus. 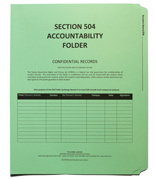 Our 504 Accountability Folders ensures maintenance and the integrity of the 504 documentation. Each folder includes a 504 meeting agenda, 504 manifestation determination agenda and tab fastener to include student documentation in one location. Order a sample of our 504 Accountability Folder! Send us an email! We will get a sample out to you right away.